Beersma,J., Agnew,M., Viner,D. and Hulme,M. (eds.) (2000) Climate scenarios for water-related and coastal impacts Proceedings of the ECLAT-2 KNMI Workshop, 10-12 May 2000, Climatic Research Unit, UEA, Norwich, UK, 144pp. Carter,T.R., Hulme,M., Crossley,J.F., Malyshev,S. New,M.G., Schlesinger,M.E. and Tuomenvirta,H. (2000) Climate change in the 21st century: interim characterizations based on the new IPCC emissions scenarios Finnish Environment Institute Report No. 433, Helsinki, Finland, 148pp. Cramer,W., Doherty,R.M., Hulme,M. and Viner,D. (eds.) (2000) Climate scenarios for agricultural, forest and ecosystem impacts Proceedings of the ECLAT-2 Potsdam Workshop, 13-15 October 1999, Climatic Research Unit, UEA, Norwich, UK, 120pp. Hulme,M. (2000) Choice is all New Scientist Vol.2263 (4 Nov), pp.56-57. Hulme,M. (2000) Heavy weather? Third Way 23, 8-9. Hulme,M. (2000) Global warming Progress in Physical Geography 24(4), 591-599. Hulme,M. (contributor) (2000) Wales: changing climate, challenging choices – the impacts of climate change in Wales from 2000 to 2080 (eds.) Farrar,J.F. and Vaze,P. , The National Assembly of Wales, Cardiff, 101pp. Hulme,M. and Carter,T.R. (2000) The changing climate of Europe pp.47-84 in, Assessment of potential effects and adaptations for climate change in Europe: the Europe ACACIA project (ed.) Parry,M.L., The Jackson Environment Institute, UEA, Norwich, UK, 320pp. Hulme,M. and Dwyer,I. 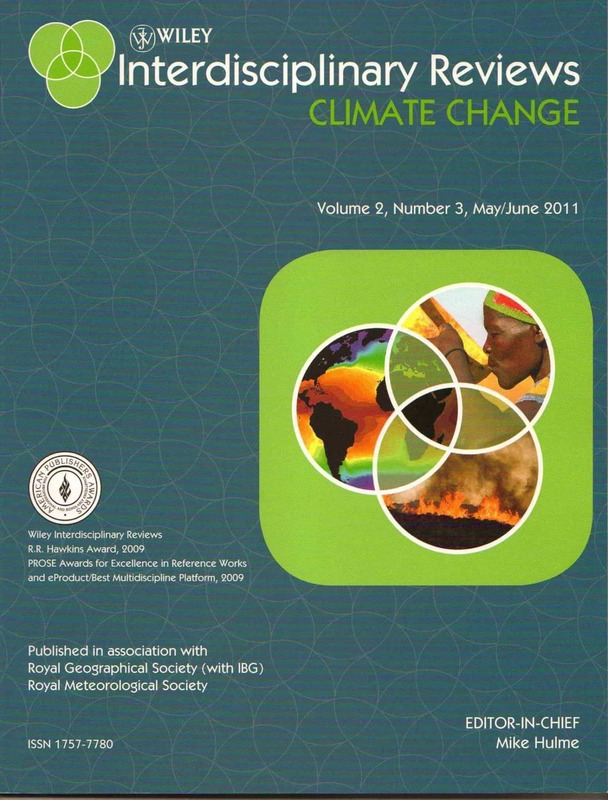 (2000) UK climate research set fair Science and Public Affairs December, pp.14-15. Hulme,M. and Sheard,N. (2000) Escenarios de cambio climatico para la Argentina pp.314-319 in, Situacion ambiental Argentina 2000 (eds.) Bertonatti,C. and Corcuera,J., Fundacion vida Silvestre Argentina, Buenos Aires, Argentina, 440pp. Hulme,M., Wigley,T.M.L., Barrow,E.M., Raper,S.C.B., Centella,A., Smith,S. and Chipanshi,A. (2000) Using a climate scenario generator in vulnerability and adaptation assessments: MAGICC and SCENGEN workbook Climatic Research Unit, UEA, Norwich, UK, 60pp. Lorenzoni,I., Jordan,A., Hulme,M., Turner,R.K. and O’Riordan,T. (2000) A co-evolutionary approach to climate change impact assessment: part I – integrating saocio-economic and climate change scenarios Global Environmental Change 10, 57-68. Lorenzoni,I., Jordan,A., O’Riordan,T., Turner,R.K. and Hulme,M. (2000) A co-evolutionary approach to climate change impact assessment: part II – a scenario-based case study in the UK Global Environmental Change 10, 145-155. Mitchell,T.D. and Hulme,M. (2000) A country-by-country analysis of past and future warming rates Tyndall Centre Working Paper No.1, Tyndall Centre, Norwich, UK, 19pp. New,M., Hulme,M. and Jones,P.D. (2000) Representing twentieth century space-time variabilty. Part 2: development of 1901-96 monthly grids of terrestrial surface climate Journal of Climate 13, 2217-2238. New,M.G. and Hulme,M. (2000) Representing uncertainties in climate change scenarios: a Monte Carlo approach Integrated Assessment 1, 203-213. Osborn,T.J., Hulme,M. , Jones,P.D. and Basnett,T. (2000) Observed trends in the daily intensity of UK precipitation International Journal of Climatology 20, 347-364. Subak,S., Palutikof,J.P., Agnew,M.D., Watson,S.J., Bentham,C.G., Cannell,M.G.R., Hulme,M., McNally,S., Thornes,J.E., Waughray,D. and Woods,J.C. (2000) The impact of the anomalous weather of 1995 on the UK economy Climatic Change 44, 1-26.